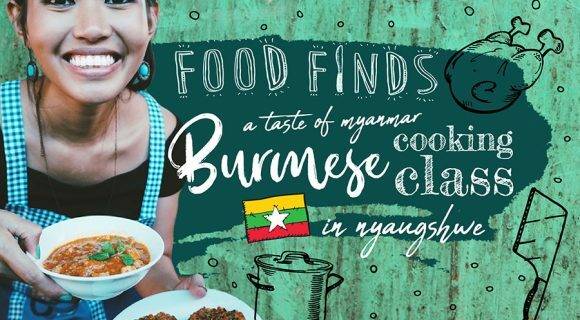 On this edition of “Food Finds,” join me in the kitchen for a Burmese cooking class and market tour with Mercury Home Family Cooking Class in Nyaungshwe, Myanmar. 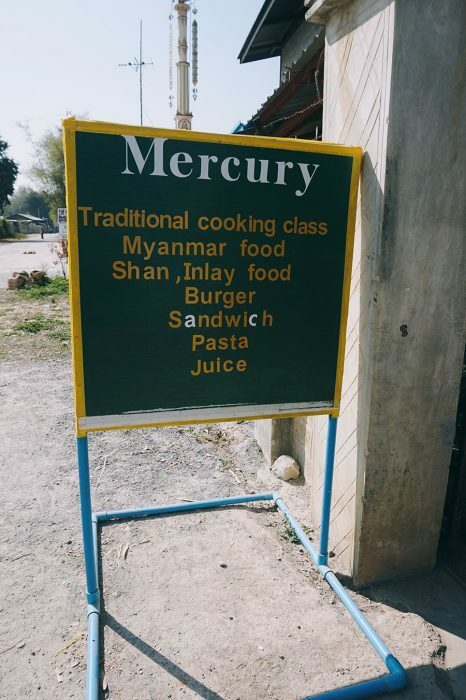 For all the mysteries Myanmar (formerly known as Burma) contains, its cuisine intrigued me the most. 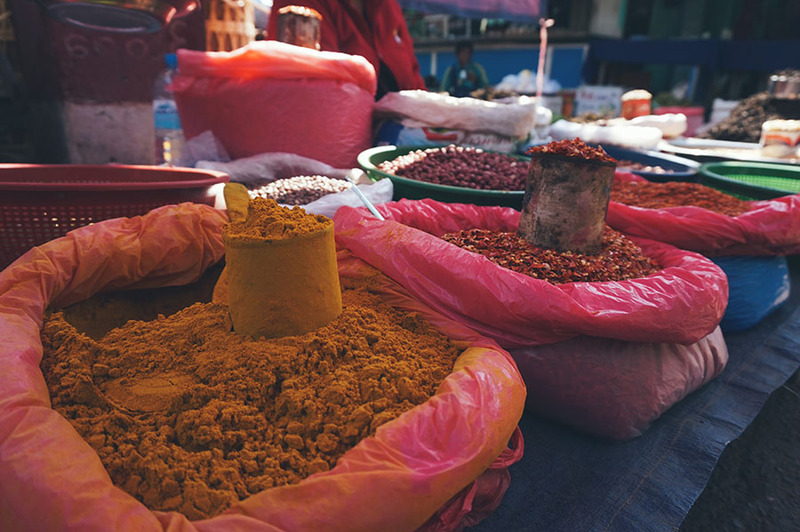 Having been under oppressive military rule and near isolation for fifty years, foreigners are only now discovering the strangely intoxicating interplay between sour and savory flavors that define Burmese food. Truth be told, my knowledge of Burmese food was next to none prior to visiting the country. 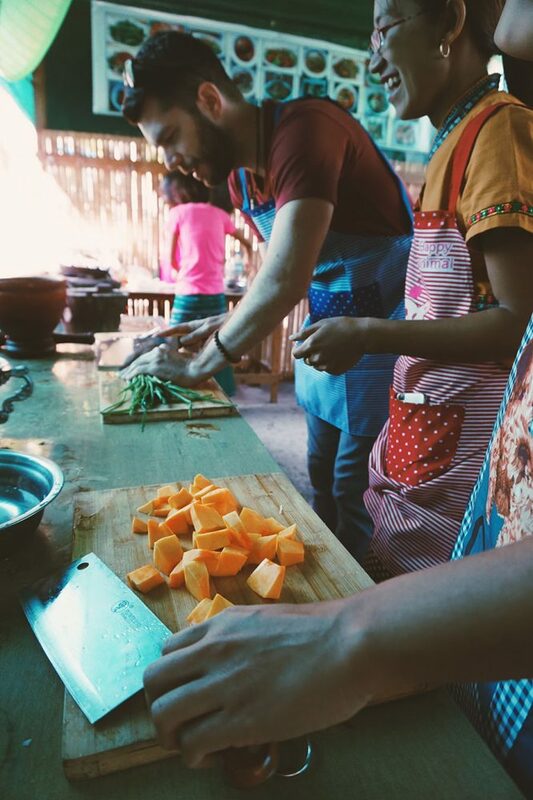 So in order to get a better grasp of the cuisine, I enrolled in a Burmese cooking class with my friend Ryan and cousin Feliss while in Nyaungshwe, the gateway to Inle Lake. Ryan’s awesome hostel, Ostello Bello, endorsed Mercury Home Family Cooking and quickly got us a last minute booking. 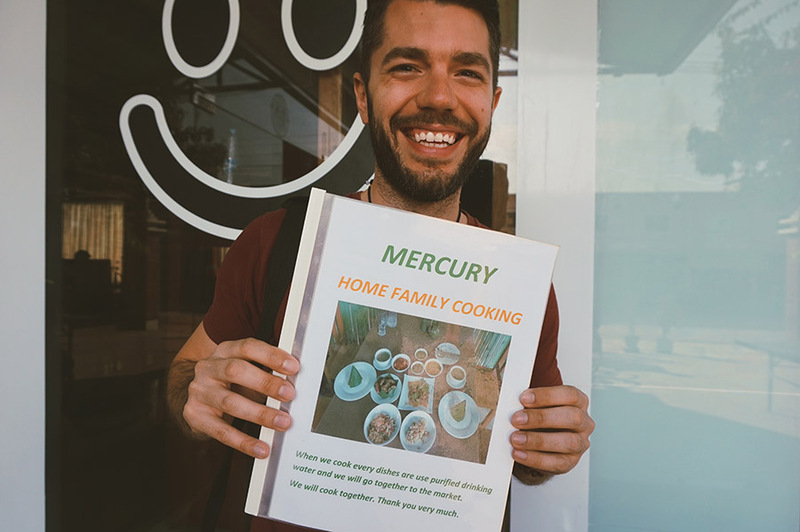 Mercury Home Family cooking specializes in homestyle Burmese cuisine. 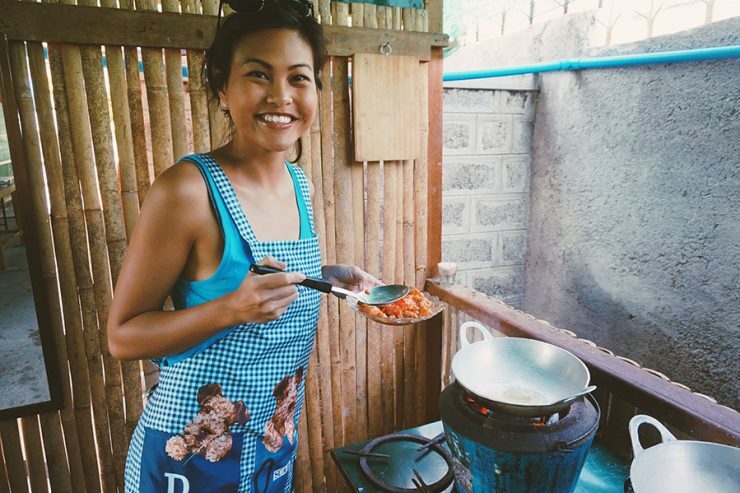 At 9 am, the owner of Mercury Cooking Class, Thi Thi, met the three of us at Ostello Bello, and gave us a huge menu spanning multiple pages, to plan out our multi-course meal. Because there were three of us joining, she let us choose one soup, three salads, and three entrees. 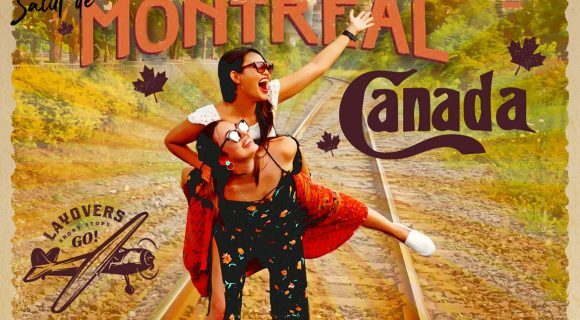 We were also the only participants for the class that day, which felt quite fortunate since we were on a Chinese New Year vacation, a popular time for traveling in the region. So, for 15,000 Myanmar Kyat (approx. $15 USD) and a “private class,” this seemed quite generous. 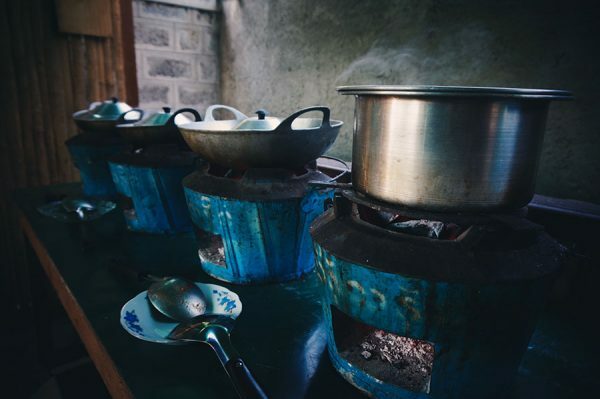 The wide breadth of choices is actually culturally significant—a typical Burmese meal centers around a plate of steamed rice with dozens of accompanying dishes, called hin, like soups and salads, along with a protein-based curry (ie. fish, pork, chicken, beef, or lamp), and sometimes a deep-fried snack. 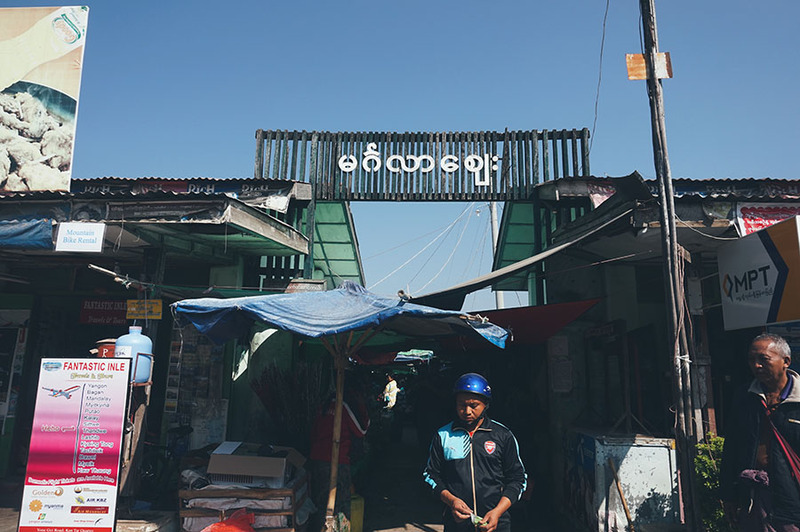 From the hostel, we headed to Mingalar Market, the central market smack-dab in the middle of Nyaungshwe. 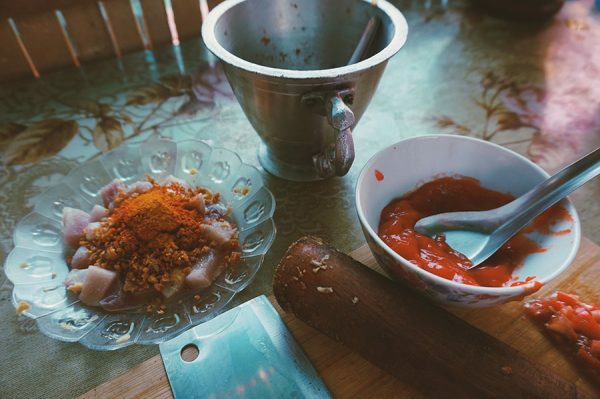 Our Burmese cooking class had a market component we didn’t even know about, making us all the more excited for this class. 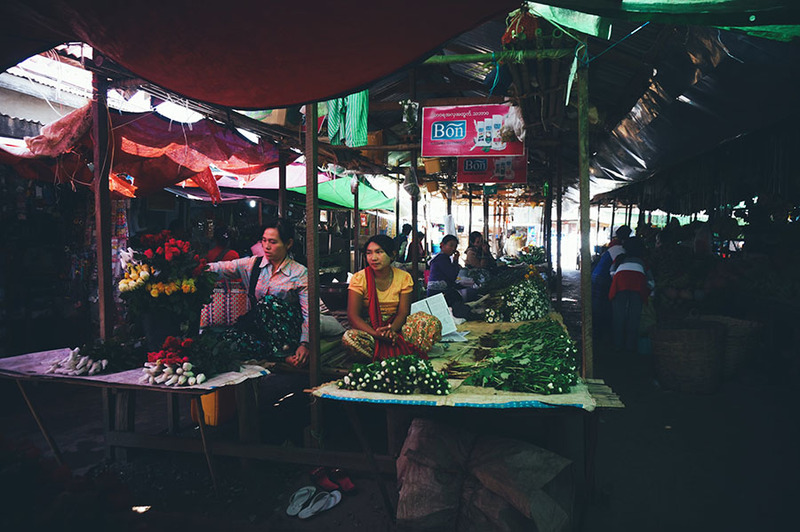 The market sells everything under the sun: from kitchen necessities, like fresh fruits and vegetables, meats, and pantry essentials, to clothing, household goods, and even souvenir tchotchkes, you can get all your basic needs and more here at Mingalar Market. 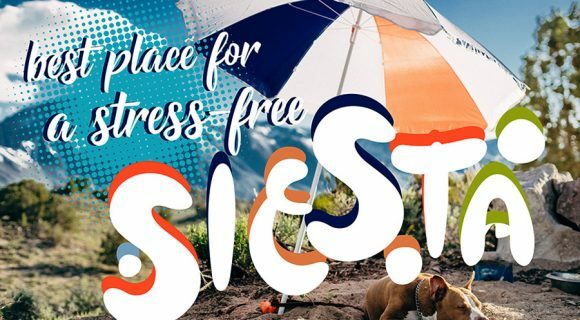 While the market has permanent stalls, it also practices the five-day market concept, inviting certain types of sellers to come on certain days of the week, almost like a rotating market schedule. 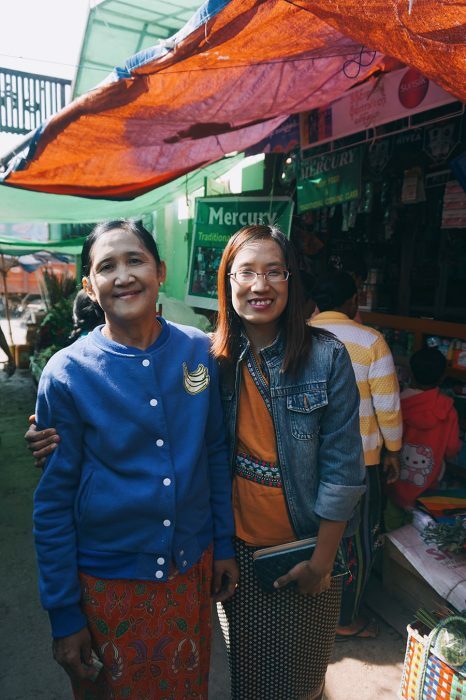 At the entrance of the market place, Thi Thi said hello to her mother, who owns a fixed stall proudly advertising her daughter’s cooking class. The store primarily sells miscellaneous household goods like tissues and baby powder. Then off we went to scout the freshest ingredients for our salads, curries, and soups. 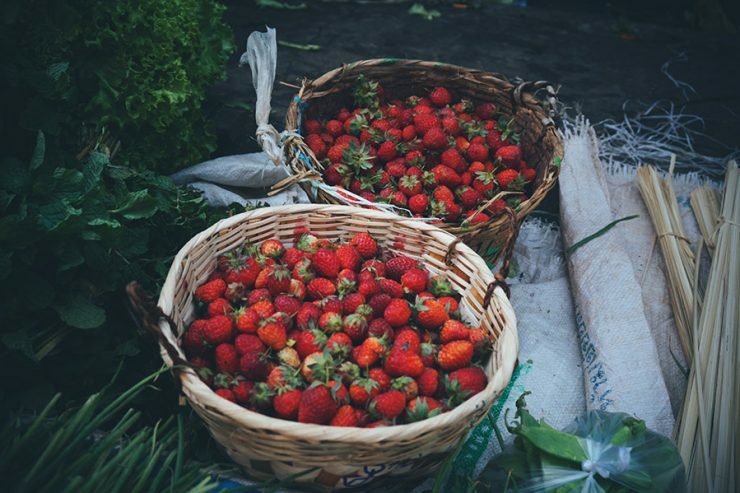 It was hard not to be distracted by the colors: never have I seen more vividly red baskets full of strawberries and bouncy, bright green bundles of herbs like cilantro and chives. Every food product in this market seemed to be thriving. 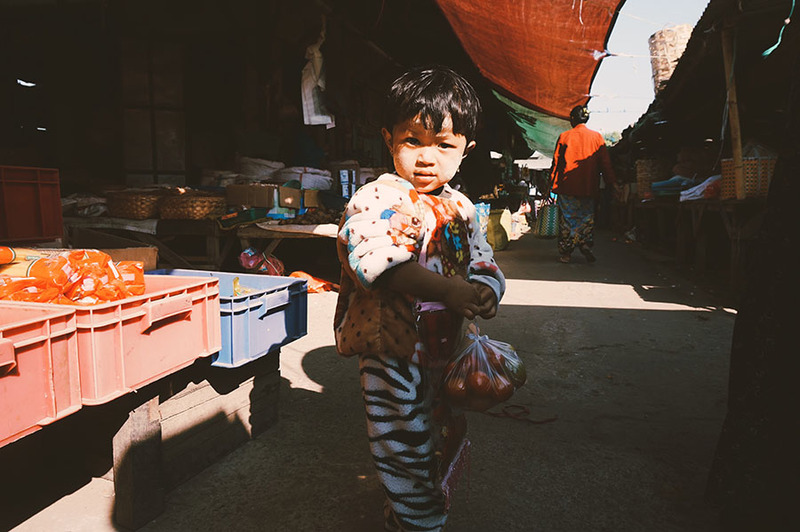 Markets are usually intimidating without a local guide to walk you through the maze-like corridors, so having Thi Thi there to answer all our questions about what’s-what was quite refreshing compared to past experiences wandering around Southeast Asia’s many outdoor bazaars. 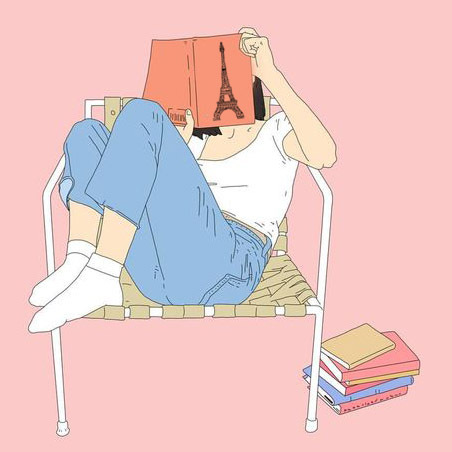 Marketplaces are one of my favorite places to people-watch. From the shopkeepers patiently waiting for an interested customer or maybe even just to chit-chat, to the many toddlers waddling next to their mothers with a natural understanding of how to walk through crowds, I found every person to be utterly fascinating and I wanted to interact with everyone and anyone. Almost every female we passed, both young and old, was wearing thanaka, the mute yellow cosmetic paste that sets the tone for female beauty in the country. Also another interesting observation: female shopkeepers tended mostly to produce, while males predominantly handled the meat and fish. Some fun takeaways in the market were the biggest avocados I ever did see, florets of “seaweed” grown on trees, and brown sugar bark that I later learned was hardened palm sugar from the sap of the toddy palm tree. 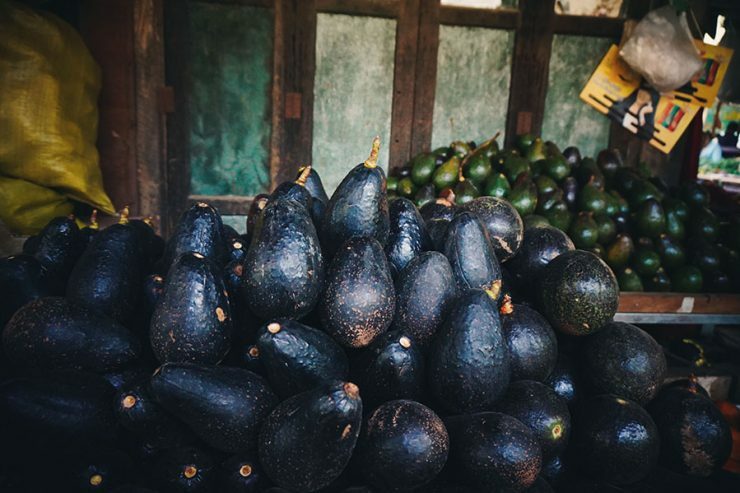 Did you know that Myanmar has a booming avocado industry? Their avocados were double the size of Mexican avocados stocked on US shelves. Upon further investigation, the “seaweed” we were using for our seaweed salad is accurately “treeweed,” in that it’s actually a mushroom! This mushroom, called the White Cloud Ear Fungus, is very popular in Chinese cuisine. And the slabs of palm sugar form the base of many Burmese desserts, usually mixed with glutinous rice flour to form chewy and sweet treats. Mingalar is clean and organized, and is easy to navigate once you get your bearings. All photos taken by Izzy Pulido © The Next Somewhere. 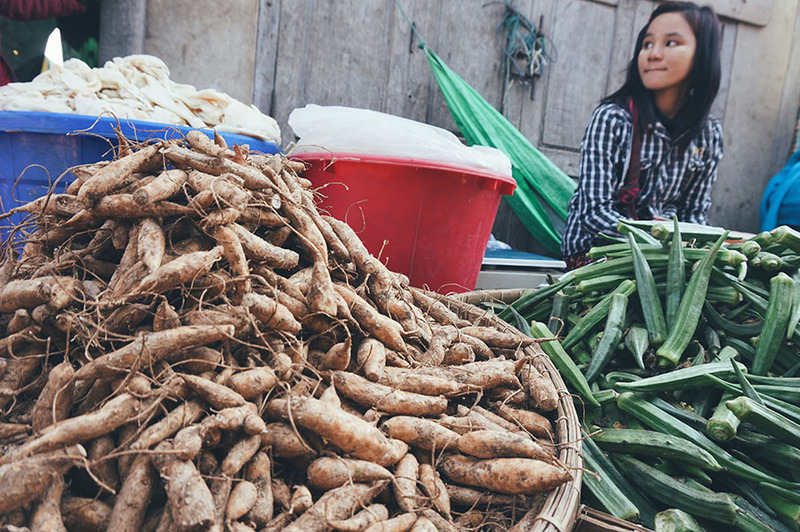 After an hourlong tour of the market, we decided to take the ten-minute walk to Thi Thi’s house to cover more ground in Nyaungshwe. 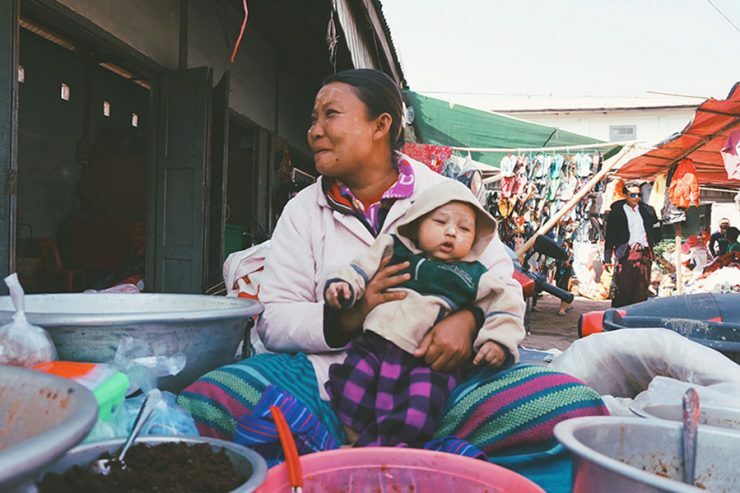 Thi Thi has lived in Nyaungshwe all her life and her home is near the Mahar Yan Aung Pagoda. Nothing but a simple sandwichboard marked Thi Thi’s humble abode. 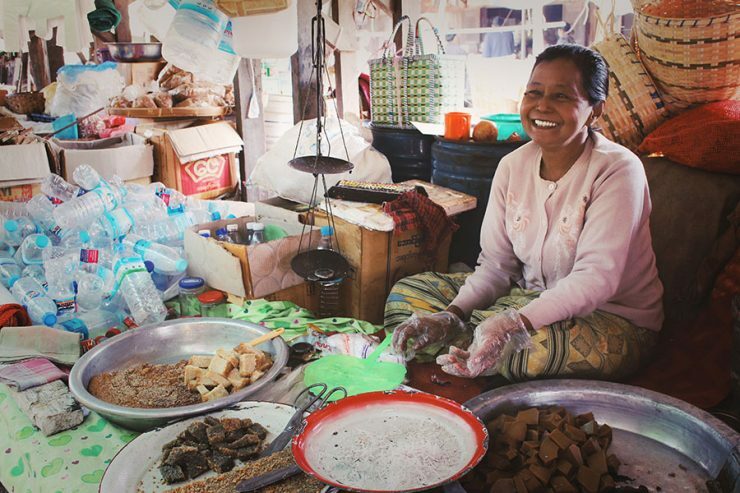 Her frontless, canteen-esque store is what almost every dining establishment looks like in Myanmar. 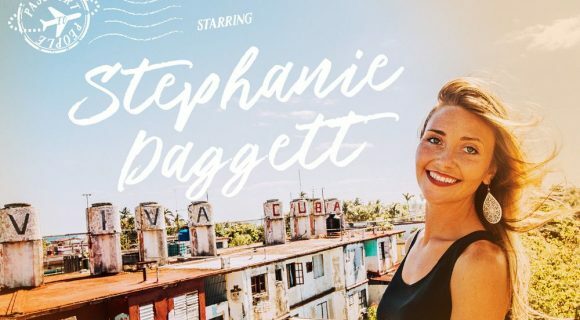 At the entryway was the dining table and at the back was the open-air kitchen, with nothing but four rudimentary coal fired, earthenware pots forming her stovetop. Next to the blue claypots was a table with a number of dry ingredients stacked neatly on top of the other in plastic see-through containers and a whole basket full of Southeast Asian condiments, like fish sauce and chili paste. Across the room was a metal folding table with three cooking stations already prepared. Each of us got our own wooden cutting boards, a wooden mortar and pestle set, and 9-inch cleavers, noticeably worn down from multiple use. 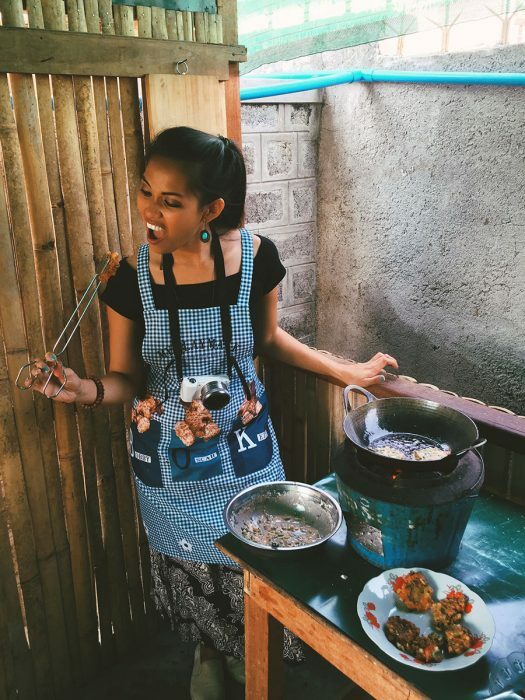 Thi Thi’s sister (and apprentice in the kitchen) came out to greet us and bring us cutesy aprons and we immediately got to work. It was all hands on deck. Everyone had to dice meat, mince vegetables, and season the curries. I appreciated how hygienic everything was. Apart from being hyper organized, Thi Thi didn’t miss a single detail: we had bowls of water to wash the meat after we diced them and plastic gloves to keep our hands from getting dirty. I was not used to wielding such a large cutting tool, but luckily, most of the blades were dull enough in the event someone nicked their fingers. 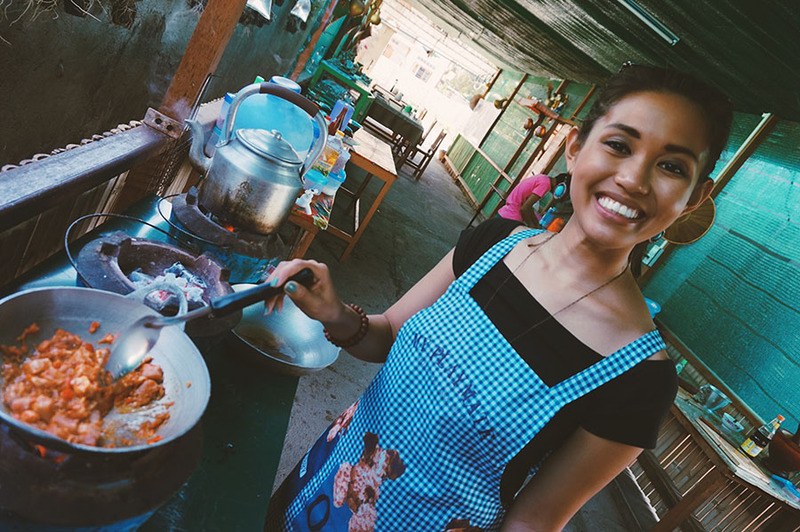 Thi Thi was super hands-on in her teaching in the kitchen and continued her informative commentary on Burmese food. She of course helped, but it was more along the lines of watching the curries cook and maintaining the heat on the burners since her stovetop was non-electric. It was hard to follow what items we were cooking but being the novice that I am, I didn’t realize we were making all things at once, since most of the curries had the same base. For the Burmese, seasoning is key, and for the curry base, we used chili powder, turmeric, salt and paprika. I was waiting to sniff out some fish sauce, but surprisingly, all we used for flavoring was a heavy hand of salt. I was shocked to see how much oil was used to cook our curries. 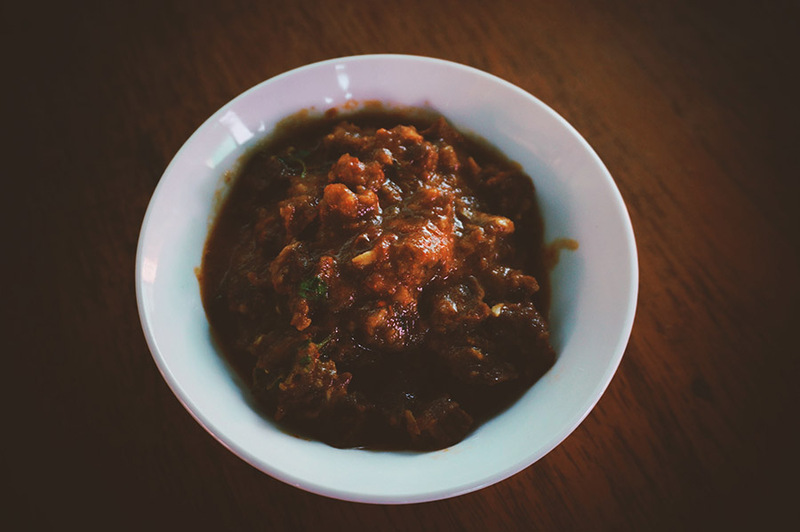 But I found out the reason why Burmese curries are so much milder than in neighboring Thailand and India is because the amount of oil used in Burmese cooking actually breaks down the chili and heat. Also, the oil prevents curries from spoiling as they tend to sit out long. Because of how high the heat gets and amount of spices used, these woks splatter easily so if you take the class, stand back. 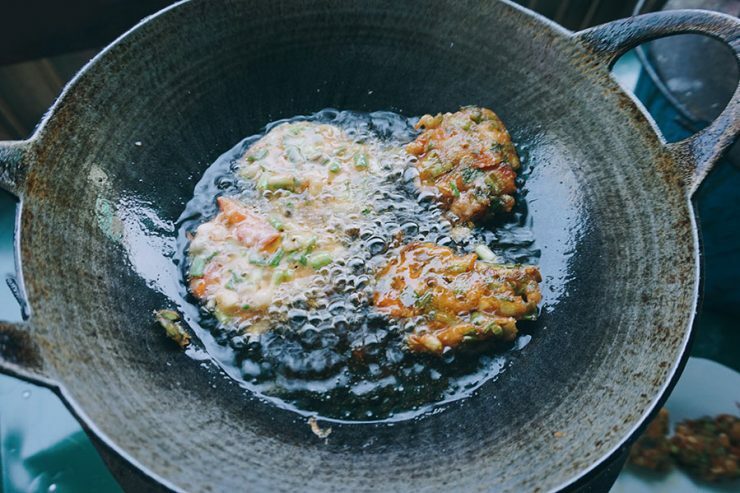 She also sprinkled in a surprise appetizer into the mix: crispy spring onion fritters called Kyethun Kyaw (kyaw means ‘fried’). 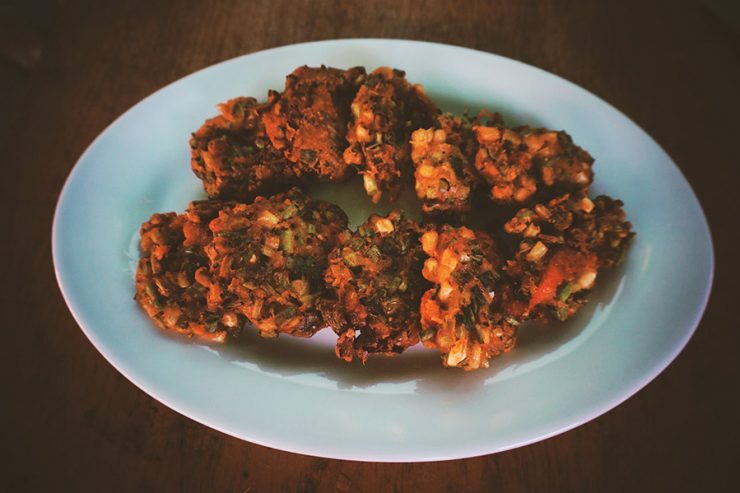 These rice flour fritters are a popular street food snack in Myanmar and are almost always served with Mohinga, a curried catfish rice noodle soup, and also the national dish of Myanmar. 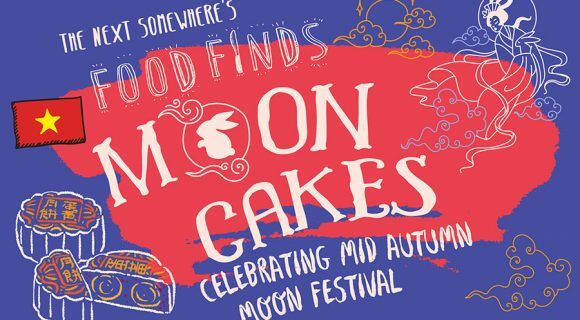 Along with chopped green onion, she also added chili powder, garlic, and tomatoes to her rice flour and ladled spoonfuls of the mixture into the oil to get these perfect oval shaped cakes. Now onto the salads. 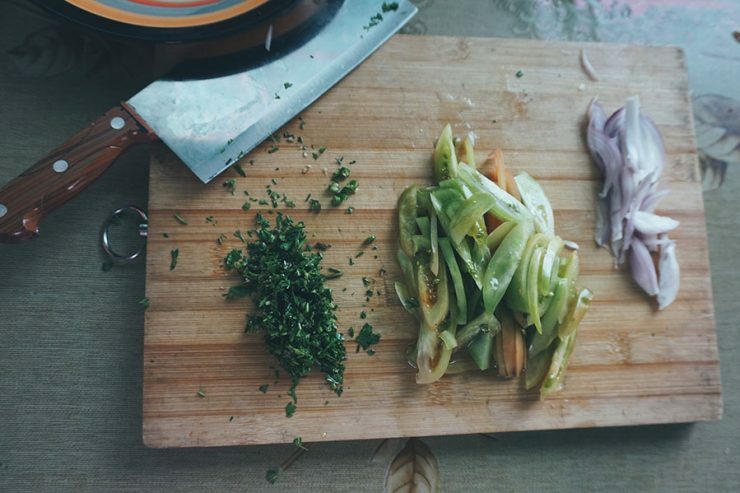 Anything comprised of chopped vegetables is basically a salad by Burmese standards. 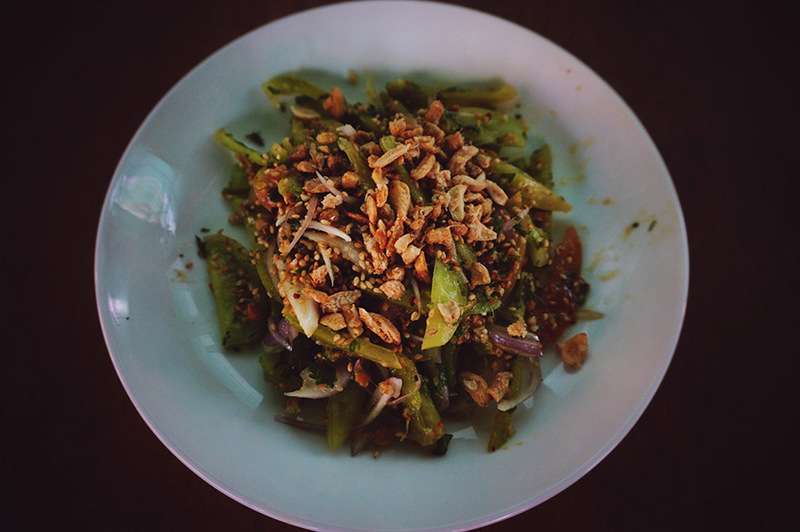 The most famous of these salads, or thokes in Burmese, is laphet thoke, tea leaf salad. 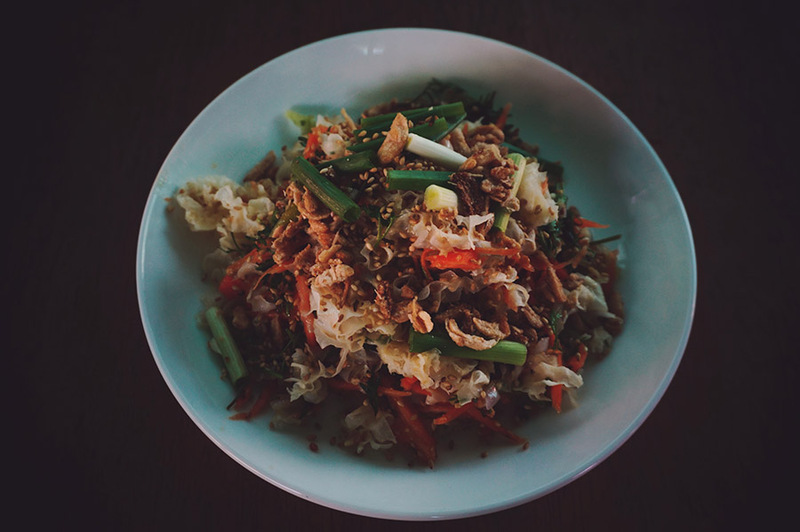 When I first encountered tea leaf salad on a restaurant menu in Yangon, I was so confused. Never in my life have I seen tea leaves being eaten. But believe it or not, the Burmese drink, AND EAT, their tea. Tea Leaf Salad is definitely offbeat, as the tea leaves used are fermented. The fermented tea leaves are then tossed with fried garlic, crispy chickpeas ,and crunchy peanuts, making for a strangely zesty and textural palate whetter. The tomato salad was made using sliced, unripe plum tomatoes, raw onions, crushed peanuts, and a pinch of chicken powder for flavoring. 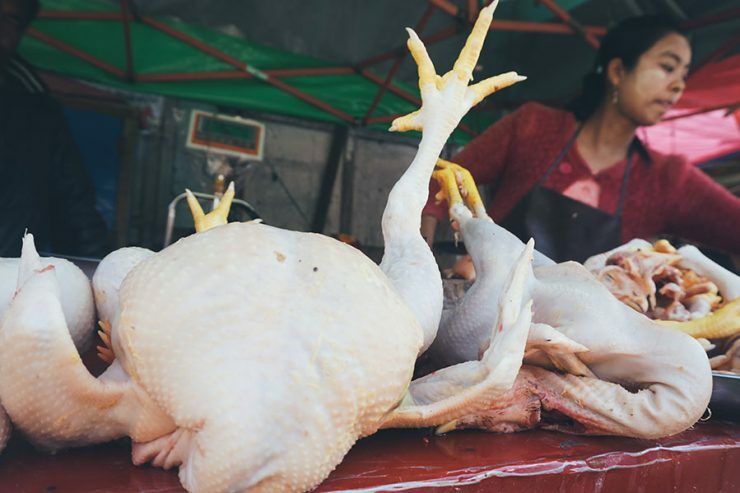 Eating in Southeast Asia is always like playing minesweeper… you never know if the “supposedly” vegetarian food has meat hidden somewhere in its makeup. 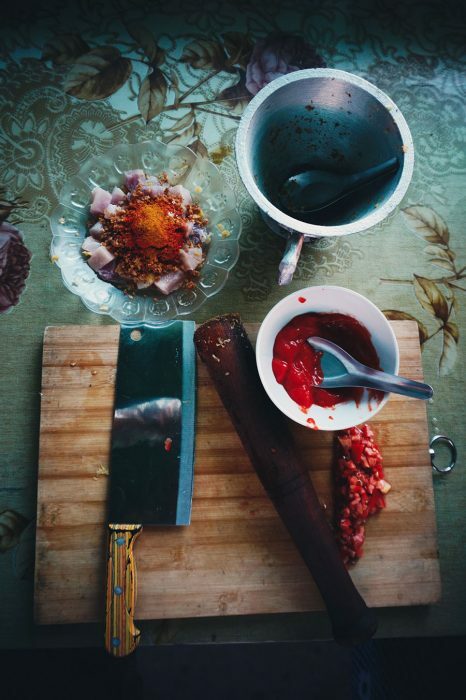 Luckily, there’s a super comprehensive vegetarian guide to Burmese food at A Little Adrift. Two and a half hours later… Ryan, Feliss and I learned how to cook a multi-course Burmese meal! We topped our salads off with toasted sesame seed for crunch and garnished our rich bowls of curries with fresh sprigs of cilantro. Close up of finished Tomato Salad (Karyanchintheet Thoke). Close up of finished Seaweed Salad (Japwint Thoke). Close up of finished Beef Curry (Amethar Hnat). 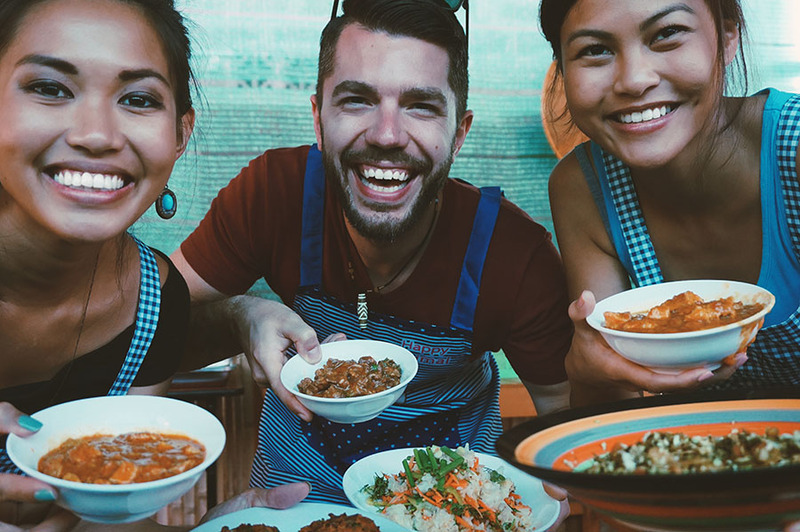 The centerpiece of a Burmese meal is none other than rice—of course it is, as rice is the pan-Asian carbohydrate of choice. While we were cooking, Thi Thi’s sister was readying our rice. The rice was shaped into a pyramid and wrapped in a banana leaf held together with a toothpick. Something else added to our table setting was a small bowl of ngapi, a fermented fish paste and the preferred condiment in Myanmar. The ngapi was the intended dipping sauce for our crispy onion fritters. They even set the table with candlesticks, so we got to enjoy our late lunch meal by candlelight. Usually, Thi Thi offers her guests avocado juice, but we declined because we were sooo full from our meal. 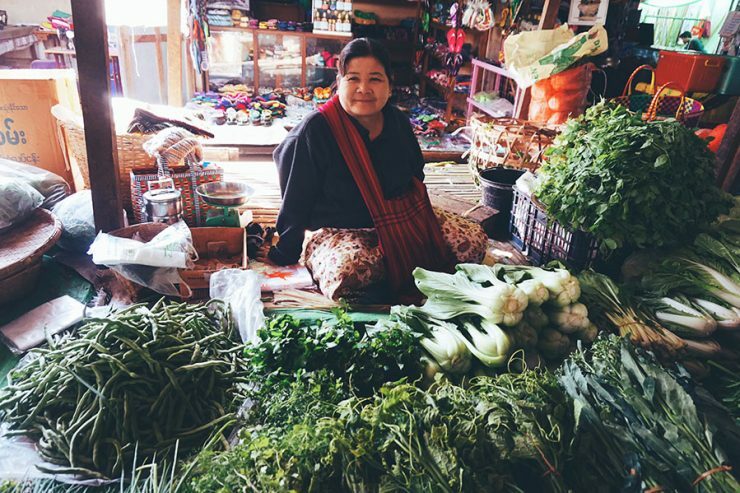 And to wrap up such a wonderful meal, Thi Thi sent us off each with a bag of dried tea leaves and turmeric, along with printouts of the recipes we cooked and tasted that day. 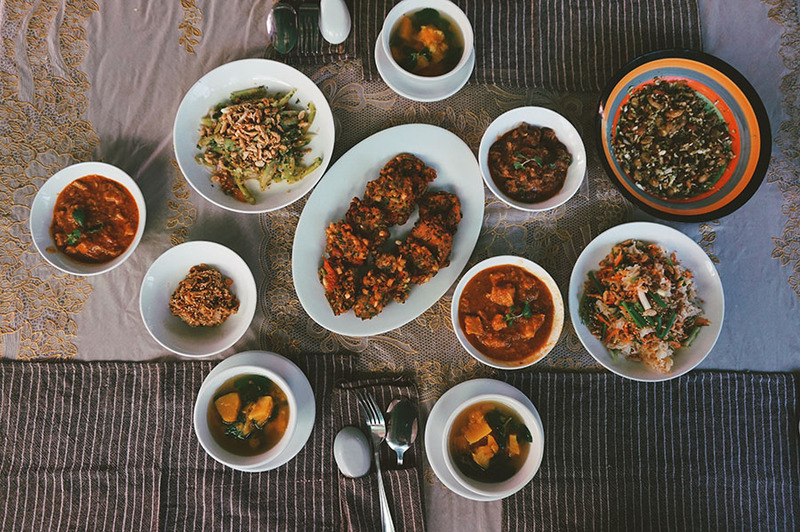 I was looking for a crash course on traditional Burmese food and I ended up taking a deep dive into such a complex and colorful cuisine. 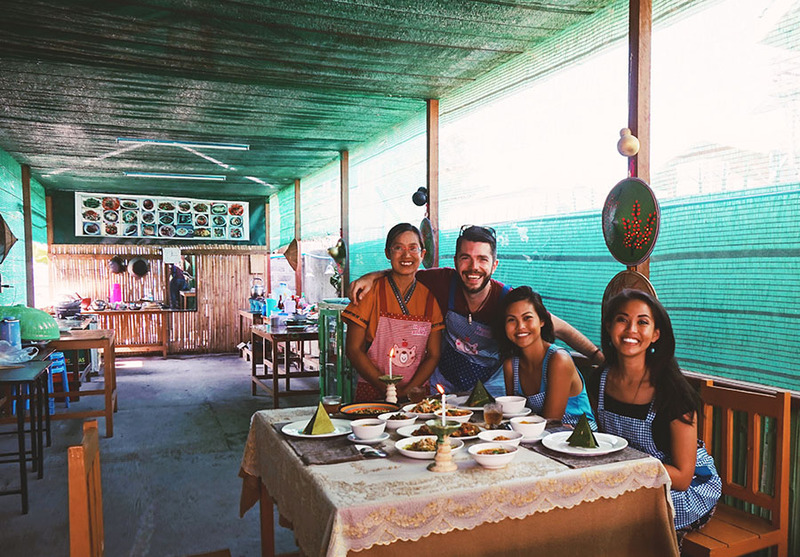 If you have a few hours to spare when visiting Inle Lake, I highly, highly recommend this Burmese cooking class. 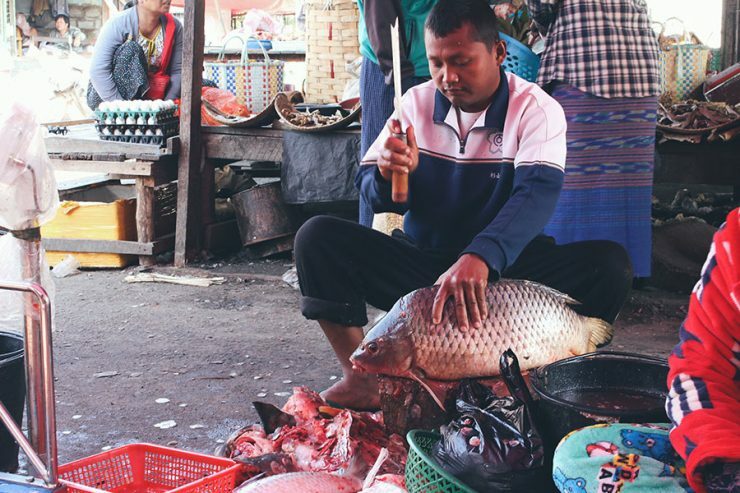 You get to explore places in the city travelers tend to overlook, and this will probably be the best meal you eat during your time in Myanmar. 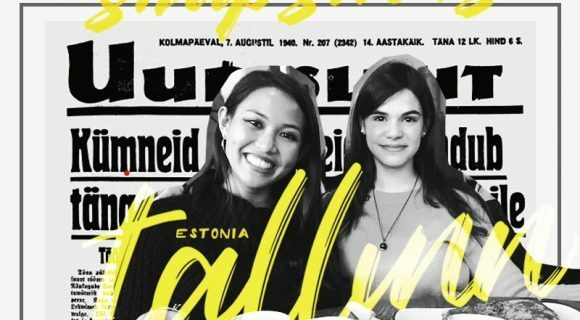 Sar kaung per sae! Enjoy your meal! The final masterpiece with a starter soup and appetizer, three salads, and three curries. All photos taken by Izzy Pulido © The Next Somewhere. 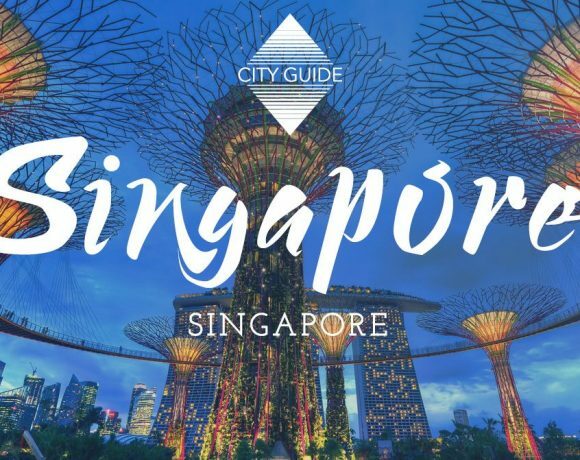 To set up a class, ask your hotel/hostel receptionist to call +95 9 253 796 716 or email Thi Thi here. 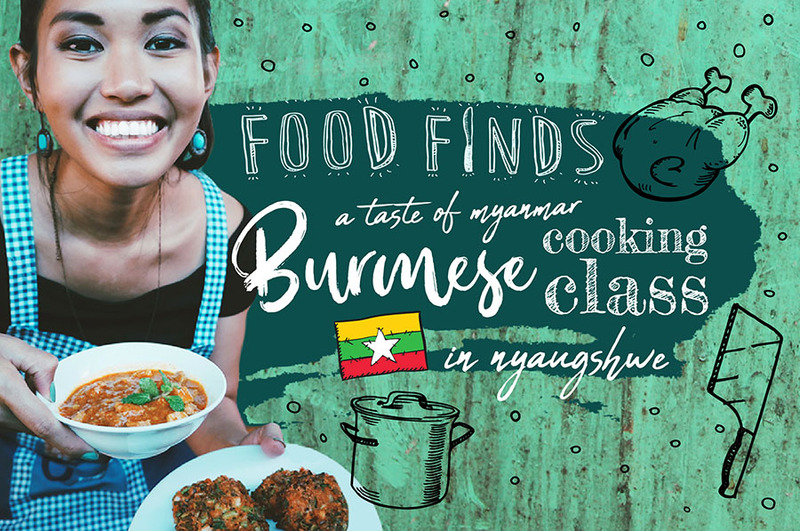  Who’s tried Burmese food? What did you think? 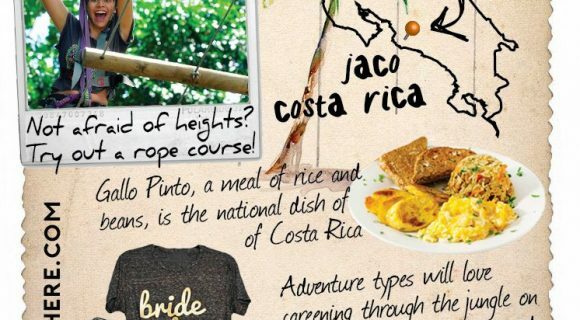 Have you ever taken a cooking class abroad that you loved? If so, share the details in the comments section. This looks so stunning!! 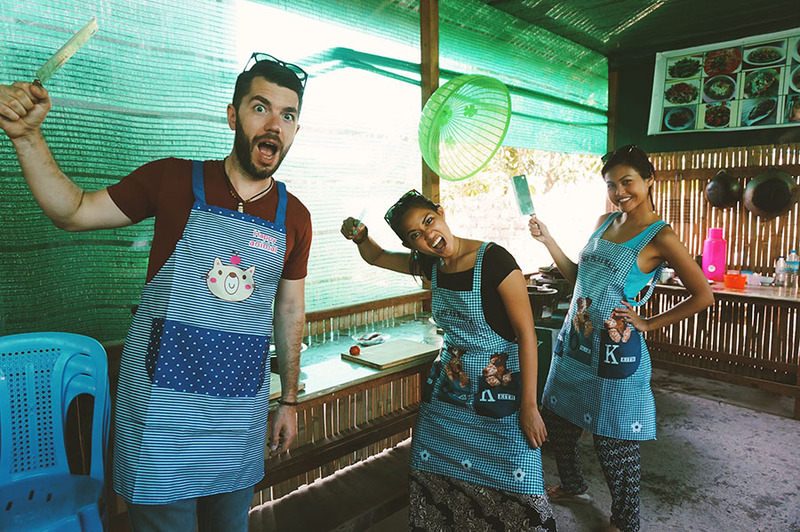 I’ve taken a couple of cooking classes in Cambodia, and they made me add “take a cooking class” to my to-do list in every country I visit. 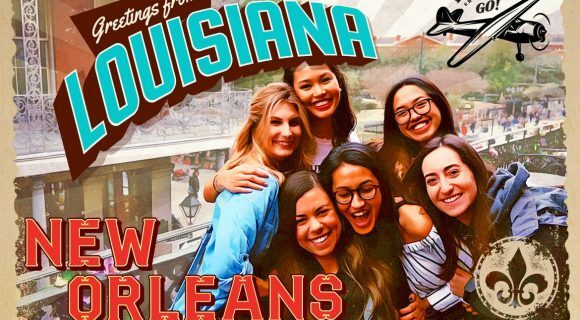 I’ve bookmarked this so I can look at it again for my trip next year. So hungry now!! This is such a great post! 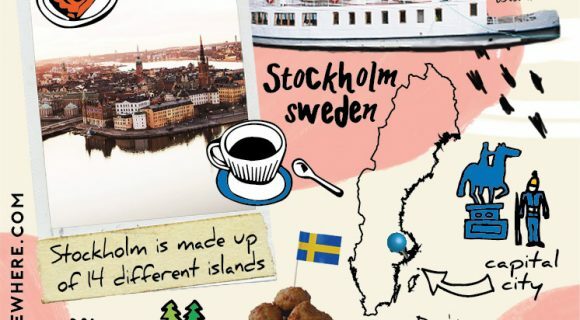 I have been wanting to do a cooking class abroad and this experience sounds amazing! It is so cool that you visited the market to get the ingredients for all your tasty dishes. I love curries, so I would be most excited to try that, but it all sounds delicious.